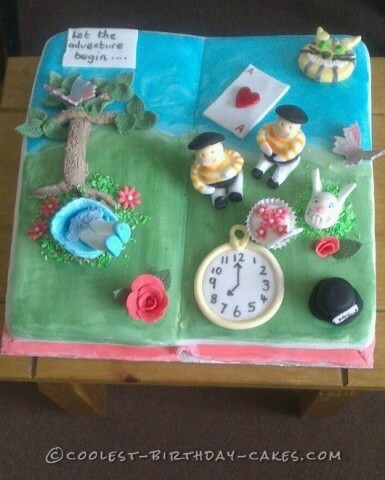 I was asked by my manager to make an Alice in Wonderland themed cake. After some thought I came up with this book cake: Alice is following the white rabbit down the rabbit hole on one page and the white rabbit is coming out of another rabbit hole in wonderland. I made a Victoria sponge in a roasting tin. I cut the cake in half and turned the two halves round so that it formed the book shape and layed it on top of a sheet of icing which was a little bigger than the cake. I crumb coated the cake and covered it in rolled out fondant icing. I scored the edges to make the pages and then painted the cake with food coloring. All the pieces on the top were made by playing around with fondant icing. They were really easy and a lot of fun to make. The grass is coconut dyed green. The cake was for a school for world book day.